This ad I saw recently has been eating away at me. A wonderful story we recently published in our first issue of Rethinking Everything PARENT by Dayna Martin on her family bed has spurred me to chime in. I was a well educated, well researched soon-to-be-mom at age 30, planning for a home birth, a 6 month leave of absence and then a paid nanny, and … are you ready? … a fantasy Skinner box for my baby. What’s that? Many of you have heard of a man named B.F. Skinner, the founder of behavioral psychology. When I was in college his theories were all the rage. Skinner had developed a climate controlled, stimulating cage of sorts for his daughter that offered up music, sites, regular feedings … all without any human interaction! What a miracle! Since I considered myself to be one of the academically enlightened, I was going to do the same! My home birth doctor (midwifery was illegal in my state and I could only find one doctor who was willing to come to my home for my birth) listened to my plans for a Skinner box during one of my prenatal visits. As gently as he could muster (he must have been shocked and outraged), he responded with, “Barbara, your baby does not need a Skinner box. In fact your baby does not even need a crib. Your baby needs your arms to hold him, your voice to sing to him, your bed to share with him.” Huh? But doctor, you’re messing up all my plans. When my son was born, peacefully and lovingly at home, my (academic) world shattered. I knew I would never go back to a job, I knew that everything I thought I knew was about to be challenged. My son never slept in a crib. As each of my children came into our lives, they shared our family bed. For years I slept like a sardine, with children and husband smashed to my sides, my arms in a straight line over my head. Our times in bed with each other were among the most profoundly bonding times we shared. For years my son fell asleep holding on to his dad’s ear. For 11 years of breastfeeding I lost virtually no sleep because it was so easy and natural to nurse a child who slept right next to me. Our mornings were glorious, waking and cuddling and laughing and reading and planning our breakfasts and days together. Our nighttimes were easy with nary a traumatic ‘bedtime’ for anyone, as we headed for bed together, cuddling and reading and rehashing the day, drifting off to restful sleep in the comfort of each other’s arms. Who would say no to this? More and more parents I know are recognizing the value of and planning for the family bed. Also academically inclined and an antepartum, labor and delivery, and postpartum nurse, I went with the current research and medical recommendations when my children were born. Unfortunately, the medical research that was/is accepted was/is oftentimes based in the ‘worst case scenario’ rather than actual evidence. Co-sleeping was one of the many ways that my children helped to change my perspective, plans, and actions according to what was natural and nurturing versus the fear-based, academically UNsupported norm. My first child slept on either my or my husband’s chest or in our arms because there was no other way he would sleep! It was a must for us. We weren’t rethinking really. We were getting by. As with all second children, our daughter benefitted from our increased comfort of going with the flow. While we no longer worried that they would sleep with us forever or that we were ‘giving in’ to bad habits, we still worried about SIDS. My enlightening birth experiences caused me to seek a new employer during my maternity leave with my daughter. I sought nursing work in which I could facilitate and support births in a more holistic, natural, family-focused way. Why couldn’t everyone have the hands-off hospital birth I had? (Homebirth hadn’t even entered my thoughts to that point.) That was when I discovered the evidence-based research on co-sleeping. This hospital made it part of our jobs as nurses to review protocols and analyze research. We re-wrote standard practice to reflect evidence-based research! We educated people on how to co-sleep safely and helped new parents to recognize the value of sharing sleep with their newborns. I remember telling each and every couple in my childbirth preparation classes about co-sleeping and joking that their adult child wouldn’t throw their keys on the nightstand and hop into bed with them. It was a great way to break the ice and help parents to focus on the moment rather than borrowing trouble with assumptions of the future. Both of our children transitioned to bedrooms with varying degrees of comfort. They would come and go from our bed, sleep in the playroom together, or set up mattresses on the floor in our room. We are the closest to a family bed now than we’ve ever been, really. You see, for the last year and a half, we’ve lived in a motorhome. The allotted bed space fit our full-size home mattress perfectly but the mattress doesn’t fit all of us very well. The kids wanted their own space so my husband built two 6 1/2 foot long bunks into the closet area. So we have a family bedroom. Our kids sleep 18″ to my left in our room. They have curtains to create their own ‘rooms’ as desired. My daughter does quite often while my son uses the curtain only rarely. I love waking in the night to my daughter’s sleep-talking, to help a sleepy child to the bathroom, soothe a bad dream, or cuddle. Our bed is piled in the mornings with all of us and our pup as we wake slowly and discuss the day ahead. Our desire to be together is functional in this small space but I often question the necessity of the traditional desire for a large home and how the space is allotted. When we were in a big home, we still used only slightly more than our current living space. Now I must go research this Skinner box. It sounds horrifying! Oh, how far we can come with rethinking. yeah it is amazing to me also what things they can invent just to be able to not put their hands on the baby.. I think there is a lot of focus on multi-tasking and going on with ‘life as usual’ once baby comes along. How many items do we need to keep baby ‘happy’ and occupied so that we can be ‘productive’? I was never more happy (nor were my kids) than when I recognized the perfection of presence. My kids and I spent an entire summer at a big waterpark when we first moved to Texas. Another mother and I were talking as we played with and assisted our young children in the lazy river. She noted a woman floating by relaxing on a tube and said, “that looks lovely but (with a smile) this just isn’t my time for floating.” It’s important to be aware of the phases of life and it feels really good to enjoy each one. While both of my kids loved this kind of kick toy that you linked, I would agree that most baby products (including and mostly cribs!) are absolutely a waste of money. They interfere with bonding (and sleep, oddly enough) and cost a bundle. I have found that the more I embrace the time I have with my kids (including our nighttime space), the more I enjoy it. If I resist and wish it away, everything is in upheaval. Why not love it all? I did not really mean to say that all toys are bad, just that there is a flow of installations that are meant to comfort the parent while “entertaining” the baby/toddler/infant/teen. I think the more toys like this above we buy (into), the more distance appears between us and the child(ren) and eventually the more (socially) alienated they become. I suppose every family has their own balance to be achieved, some families use a lot of toys, some none. Me and my son use them sparingly and I appreciate that he (like somebody else said below) is very happy and able to play with whatever is available. The world is his playground. it’s all so interesting. I have a nephew who is raising his daughter with no toys. on the surface you want to think ‘oh, that poor child,’ but in reality she is so amazing and engaged in everything around her, sitting for 15 minutes at a time trying to screw on a top to a jar, for example. my son is raising a daughter too – she is just 4 months now – and when I asked him whether she was using the teething toys I sent her he said no, she doesn’t any part of them because she has my finger to chew on. of course! it’s all about engagement and commitment and connection. I admit it. I did not have a family bed. I don’t hate myself for it, although I do wish it could have been different. (I could have been different?) The truth is, when I had my son, I had no husband or mate. It was just me and him and I could not sleep with him. Perhaps I bought into the safety issue. And then again, I just could not *sleep* with him. The times we would lay down together, I could not sleep. I *had* to sleep or I wouldn’t be able to take care of him when I was awake. There was no one else there to take turns with. So he had a crib and I had a bed. I was exhausted beyond belief, doing it all alone. I’m sure many will say that if we had slept together, it would have been easier, but I’m not so sure. It is hard to claim any absolutes on anything, especially if you have never been there. Amazingly though, he is and has always been a fantastic sleeper. In fact, when I compare notes with other parents, he was probably one of easiest sleeping kids I’ve known. We rarely had bedtime issues. It was very common for him to tell me that he was ready to go night-night. Over the years, he has said on several occasions that he likes sleeping alone. So, I guess that whereas the family bed may be preferable, it is not always for everyone. Do accidents happen? Yes. My brother-in-law lost an infant son in a family bed. It was tragic. 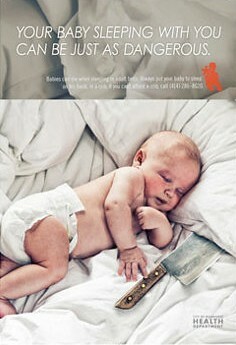 Does that mean that a family bed is absolutely dangerous (like sleeping with a butcher knife)? No. Many babies die in their cribs, alone. Sigh. It is not black and white. I wish a lot of things were different back then. I would make many different decisions if I knew then what I know now. was the cause of death determined in your BIL’s situation? was it due to some aspect of the family bed or was it a death that would have occurred if the infant had been in a crib? I do not not specifically. My understanding is that he suffocated. From what, I do not know. Of course you should not beat yourself up for it, we do what we do, at that moment. And we know what we know. If you had the feeling that you could not sleep with your child in the same bed, than that was your truth at that moment, wherever it came from..
We are all learning as we go and we are not all Barbs (I mean that as a big compliment, Barb:-) I know you do not fall for it, but still:-) ) and we all have our preconceived ideas and things from the past that keep us within “social” borders. And while the story of your brother in law is so so sad and dramatic, and I cannot imagine anything worse than that, we can never know all the details of a story if we were not there to whiteness it.. Even if we were there we may have our own vision or variant of the same story.. I learned to never use somebody else’s example for justifying my own choices, as I believe that we have all the answers within us. Just listening to that voice is enough for me. And while I believe the family bed or any of the “Un-choices” is the best we can do for our children (and for the parents, too! ), me personally I would never advocate that we do not listen to our own limitations, as pushing ourselves to do something that does not match us in that moment could have more serious consequences..
everything complete honesty would be the most helpful. aside from some urine dampness with infants, yes, in my experience the whole 11 years of my family’s family bed was enormously joyful. we all have our own experiences though… tell us what you are thinking or what aspects of the family bed seem doubtful to you. I am all ears (eyes, in this case). Compared to Barb I have a very short experience (and only one child) but my family bed is also only joy. Like Barb, I also want to hear about your experiences (or anyone else’s!) that do not mach that picture. Ha! This was part of our experience too. The natural move toward independence is different for each child and they are empowered as they experiment with the process… you can feel it as a parent and it is so rewarding to create the space for them to transition completely on their own accord.